Welcome to our Paper Craft Crew Sketch Challenge #268! The awesome thing about sketch challenges is that YOU get to choose whatever stamp set, colours, designer papers, etc., that you want to use! All you have to do is follow the sketch outline! You can substitute the large circle shape for a different shape; you can turn it sideways or upside down! Have fun with it – just join us! As you can see, I took a bit of ‘liberty’ with the flourish elements on the sketch. I decided to use the banners in the Birthday Delivery set, instead! I purchased the Birthday Delivery Bundle, which includes the Birthday Delivery Stamp Set, the Birthday Memories Designer Series Paper, AND the Birthday Friends Framelits Dies. By doing this, I saved myself 10% on the combined price of these 3 products, AND saved myself a whole lot of time in creating this card! 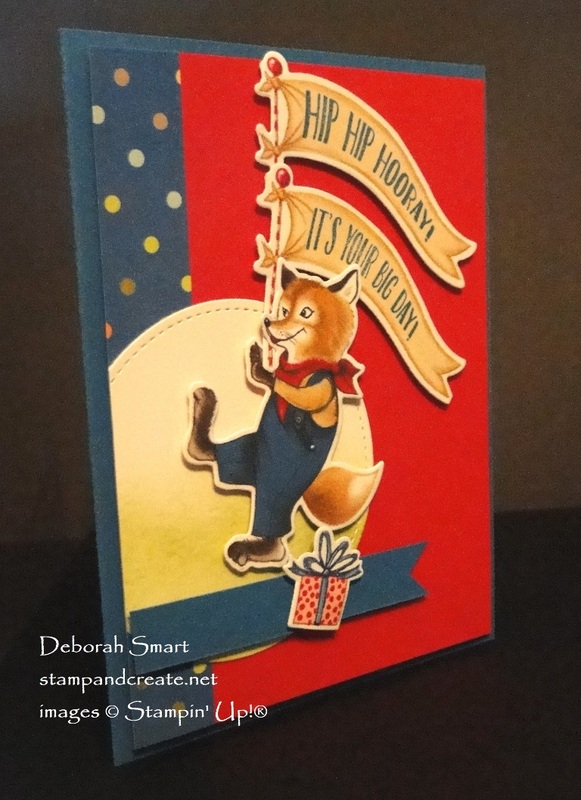 The fox, banners, and gift are all die cut from the Birthday Memories Designer Series Paper, with the Birthday Friends Framelits. Talk about easy and convenient! I then used the Stitched Shapes Framelits to die cut a large circle from Whisper White cardstock. The banner and card base are Pacific Point cardstock. The strip of DSP is another pattern from the Birthday Memories DSP. 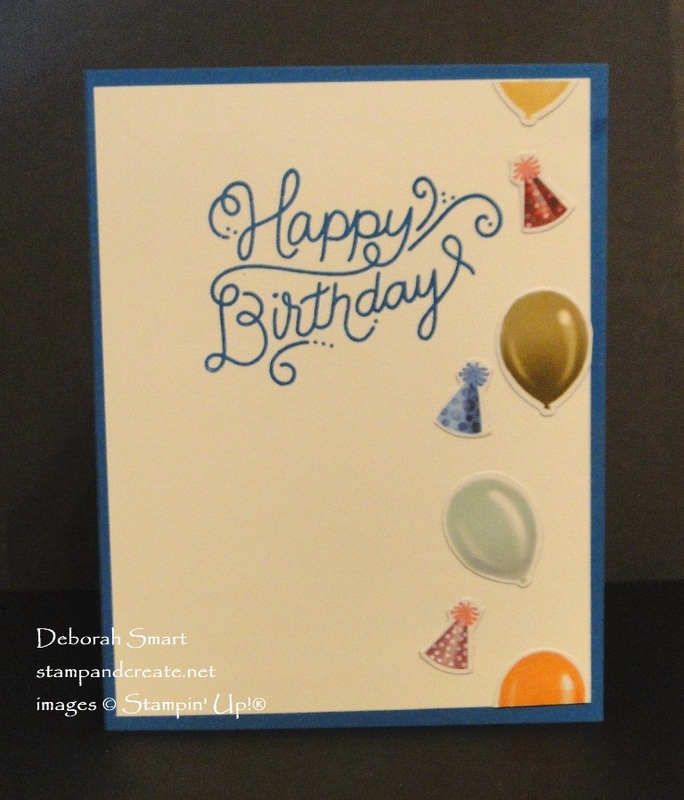 The sentiments, both from the Birthday Delivery stamp set, are stamped in Pacific Point ink directly onto the die cut banners. To create the grass under the fox, I used a Sponge Dauber with Old Olive ink, and sponged the ink onto the die cut circle. Putting this card together is also quick & easy! The strip of polka dot DSP is attached to the 4″ x 5 1/4″ Real Red cardstock panel, with Multipurpose Liquid Glue. The stitched circle die cut is glued on top of that – with a bit of the circle overhanging on the left. Next, attach the fox onto the circle, with Stampin’ Dimensionals. Add the stamped banners above & behind the fox, again with Dimensionals. The banner is then added below the fox; again with a bit of it overhanging on the left side of the panel. Finally, the die cut gift is attached with a Dimensional. Before attaching your front panel to the card base, turn it over, and from the back, use Paper Snips to trim off the excess circle and banner that are hanging over. Now you can attach the front panel to the base, with Dimensionals. As you know, I love to add something inside my cards! It should be just as fun as the outside, right? I cut a Whisper White panel of 4″ x 5 1/4″, and glued it to the inside of the card. The sentiment is stamped in Pacific Point ink, from the Birthday Delivery set. This sentiment script looks like a party all by itself! Then I used the Birthday Friends Framelits, and die cut the party hats and balloons from another piece of the Birthday Memories DSP. I use the Liquid Glue, and glued them down the right side of the panel, for a fun look. I love how this card looks like I spent ages working on it – but it was so quick! All of the die cuts add such dimension and fun to this card. Ordering supplies is easy! Click on the product images below for the supplies I used. Or, click on my signature to go to the front page of my store. My online store is open 24/7, so you can shop whenever you want! Next Next post: RESERVE YOUR STAMPARATUS TODAY! 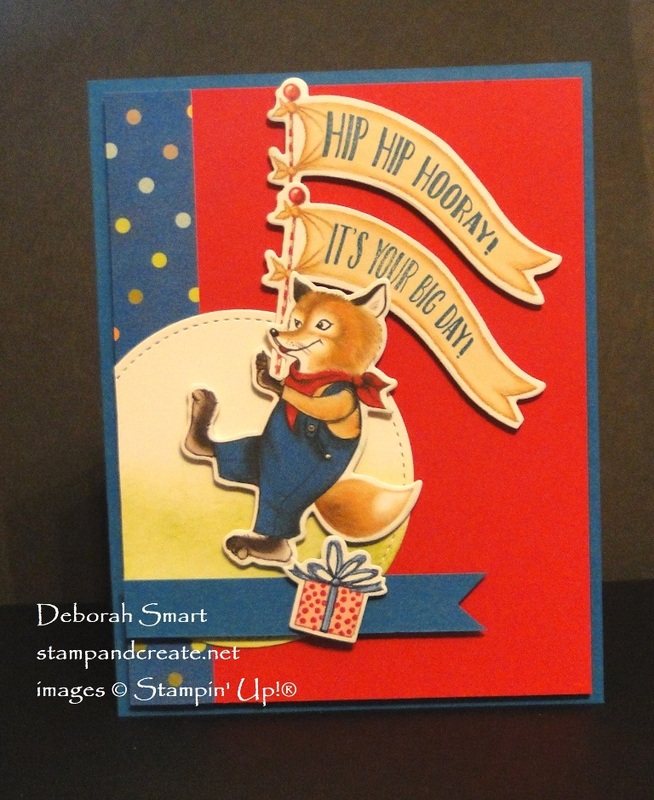 Such a cute card, Deborah! I love this bundle, and the double banner is so fun. I’m glad you like the double banners, Buffy! I was worried they were a bit of ‘stretch’ for the sketch! This card is just adorable! I love him balancing on the box!